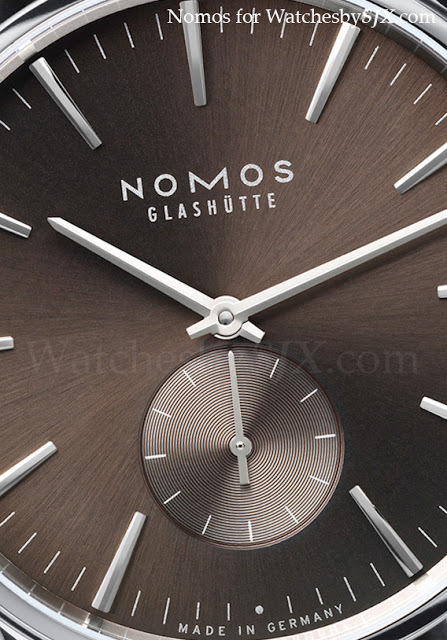 Glashütte-based Nomos, best known for its monochromatic and austere Tangente, has unveiled two attractive dial colours for its Zürich wristwatch, originally designed by the late Swiss designer Hannes Wettstein. The first, and my favourite, is the Blaugold (“blue gold”), a galvanised, metallic blue with sunburst brushed finish. The other is the Braungold (“brown gold”), which is metallic brown. 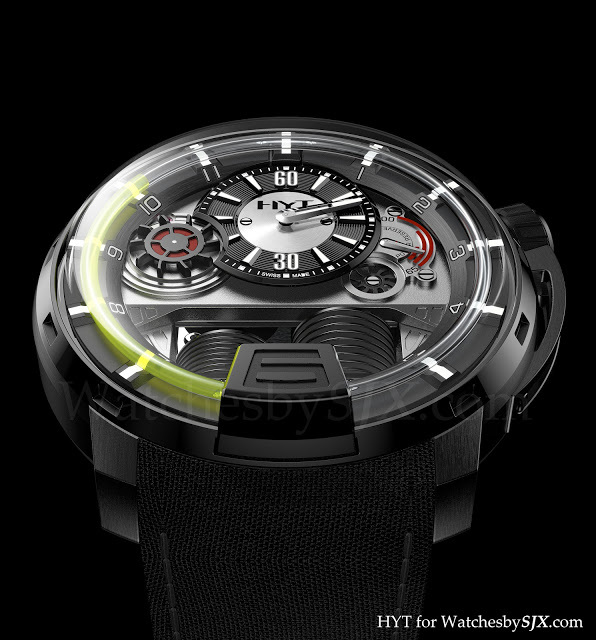 Both watches have the 39.7 mm wide Zürich case and contain the in-house Epsilon automatic calibre. The retail price will be approximately EUR2900, about 10% more than the regular Zürich models. 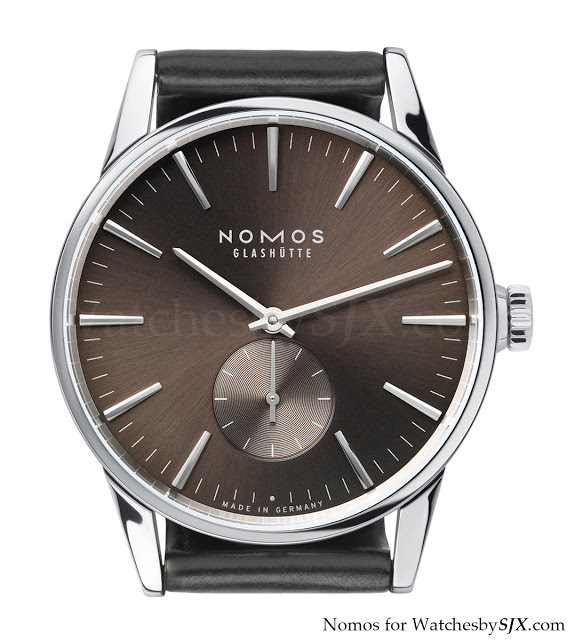 Though these are just variations on an existing model, Nomos watches are so well designed and so well priced, I own two, that you can’t help but like them. 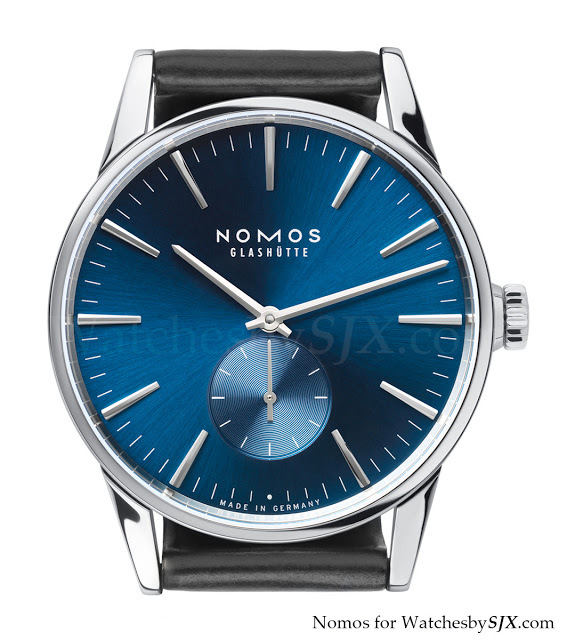 Featuring a new, galvanised blue dial, the Nomos Zurich World-Timer True Blue boasts the in-house, Nomos Swing System escapement - all for the same price as the existing Zürich Weltzeit. Tudor has just unveiled the second Heritage Black Bay in dark, muted colours, in stark contrast to the original model. The new Black Bay features a midnight blue bezel and black dial with silver indices. Breitling has just unveiled the Blacksteel version of the Navitimer Cosmonaute. With its trademark 24-hour dial, the Navitimer Cosmonaute Blacksteel also features the in-house B02 movement. 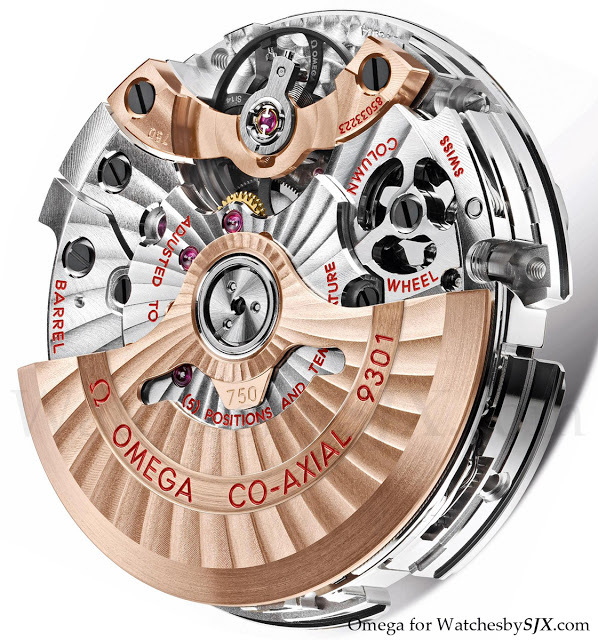 Omega’s Co-Axial calibre 9300/9301 is impressive and illustrative of the company’s push into higher end but industrialised movements. It is a chronograph with column wheel, the Co-Axial escapement invented by George Daniels and the free-sprung Si14 silicon balance wheel. And it has an hour hand that can be adjusted independently without affecting the setting of the minute and seconds hands. 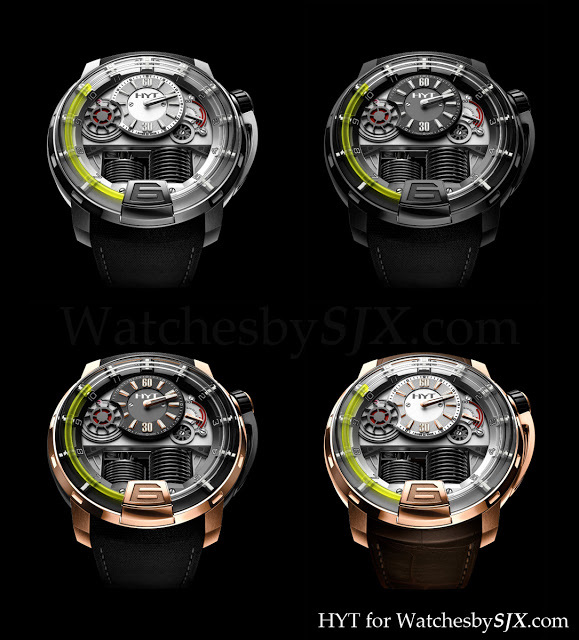 Also, the hour and minute chronograph hands are co-axial on the sub-dial at three. 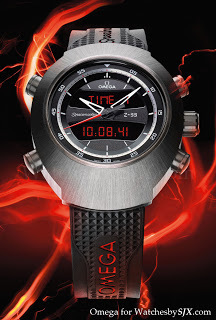 Plus Omega delivers it with a four year warranty. Previously seen in the Speedmaster and Planet Ocean, the calibre is presented in the more formal DeVille case at Baselworld 2012. This has an attractive and detailed dial, with diamond-polished hands and indices in solid gold. The facets on the Roman numerals indices are an especially appealing detail. 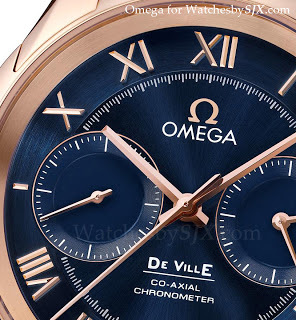 The case is 42 mm and available in red gold or steel. 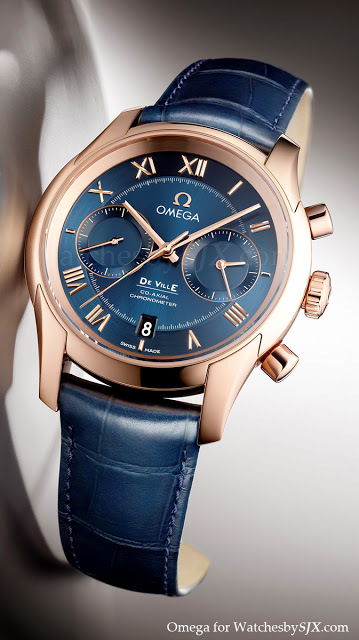 The red gold is available with blue or silver dial, while the steel version offers the choice of silver, blue or black dials. Inside the red gold version sits the cal. 9301 with a solid gold rotor and balance bridge, and the steel uses the cal. 9300 which is the same except it has a rhodium-plated brass rotor. 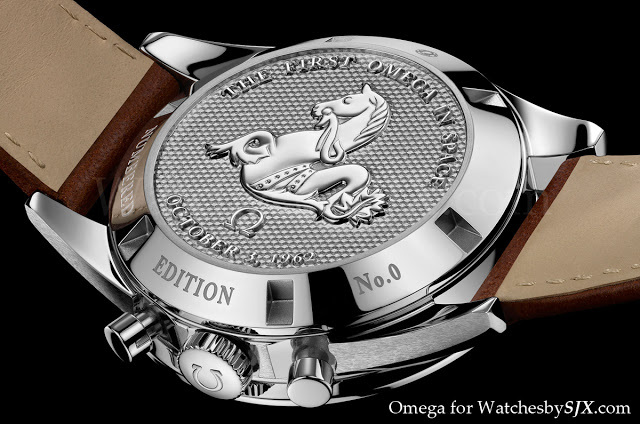 Strangely enough one of the most interesting Omega products at Baselworld 2012 is a quartz watch. 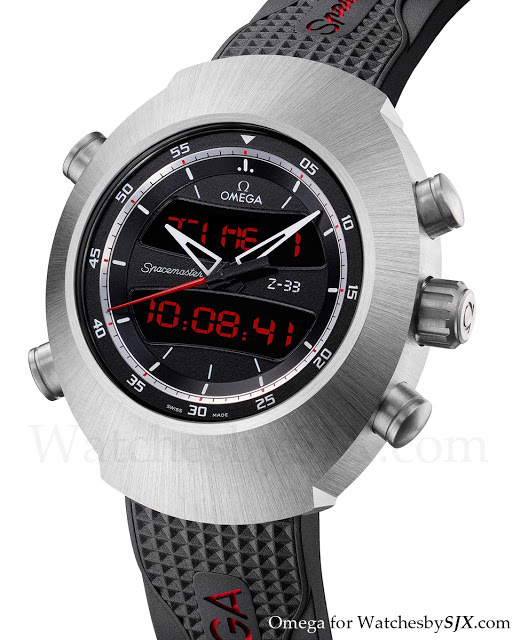 The Spacemaster Z-33 multi-function pilot’s watch is the successor to the discontinued X-33 (Omega is running out of letters). Highly regarded amongst pilots, the X-33 was an official watch of NASA as well as the US airforce; versions with squadron logos come up on the secondary market occasionally. Omega has just remade the first Speedmaster worn in space (so not technically a moon watch) and presented it at Baselworld 2012. This is a reissue of the watch astronaut Wally Schirra had on during the Mercury Atlas 8 mission in October 1962, which he bought for himself. 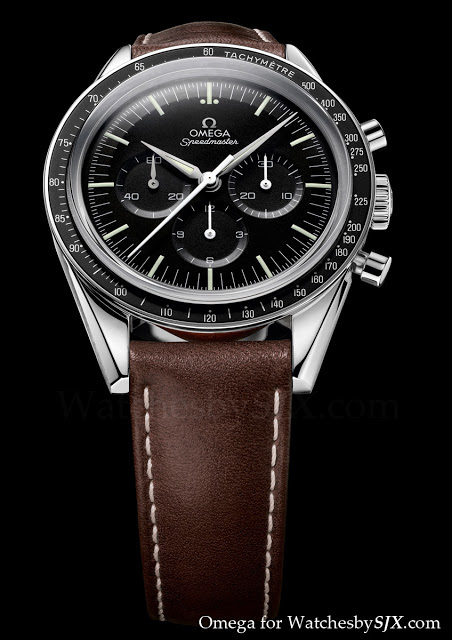 This year is the 50th anniversary of that mission, hence the Speedmaster “First Omega in Space” limited edition (ref. 311.32.40.30.01.001). 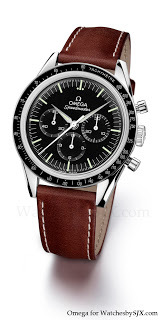 Mr Schirra’s watch was a mere Speedmaster, as it came before “Professional” was added to the Speedmaster moniker. That happened in 1966 after NASA officially selected the Speedmaster as its space watch. The idea behind it is simple. The clear tube running along the circumfrence of the dial has two immiscible liquids inside, one clear and the other a fluorescent green. The meniscus of the two liquids indicates the hour and as the hours pass, the meniscus travels forward clockwise. This is thanks to two bellows, made from a flexiable alloy, which are driven by pistons, situated at six o’clock. Once the meniscus hits six o’clock, it quickly rushes back to six on the other side, like a retrograde hand, and starts over. (A video at the end of this post illustrates the concept nicely.) As for the rest of the dial: at nine o’clock on the dial sits the seconds hand which resembles a water wheel. Adjacent to it is the minutes display and then at three o’clock is the power reserve indicator. 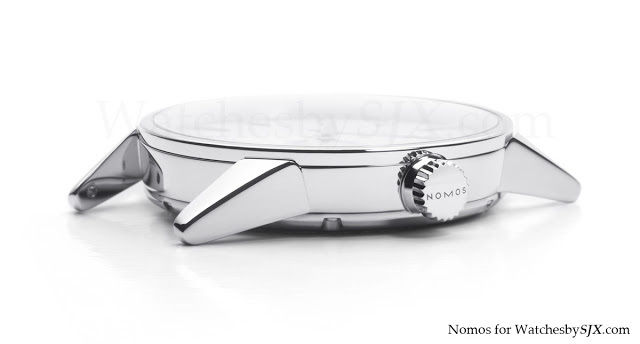 This is a large watch at 48.8 mm wide and 17.9 mm thick. 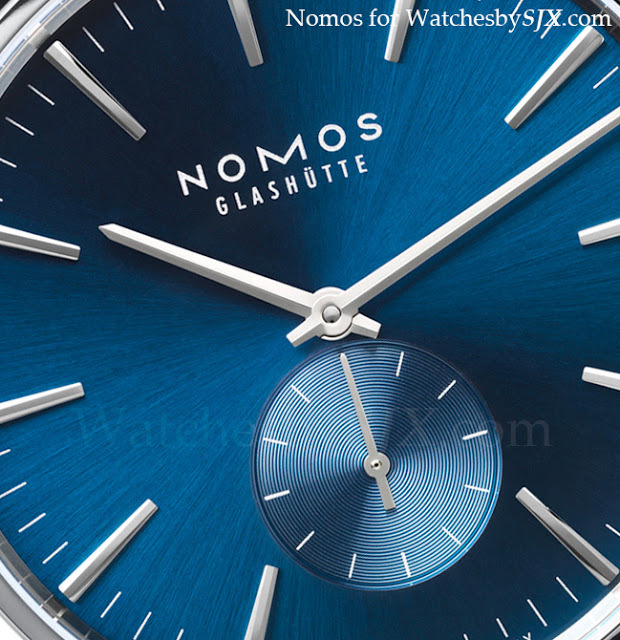 The domed sapphire crystal alone is 5 mm thick, because it has to accomodate the tube containing the two liquids. The movement runs at a conventional 28,800 bph and has a respectable 65 hour power reserve. The H1 is a very intriguing idea, and one that will be exceedingly interesting if it works as planned. There are so several things I can think of that might go wrong, like the fluids mixing or evaporating, though HYT says all of these have been addressed. 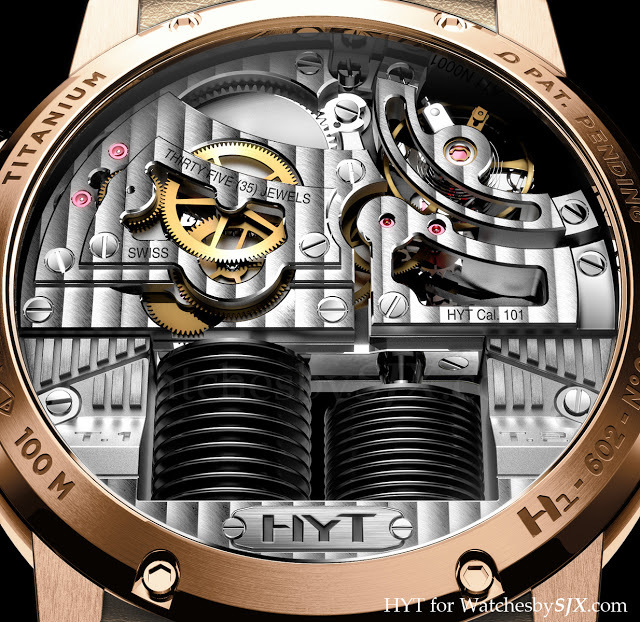 And as has become the norm in independent watchmaking, thanks to Max Büsser’s “friends” concept of listing each and every person involved in the creation of his Machines, HYT has revealed the identities of all the key individuals behind the company. To realise this novel mechanism required two teams, led by from Audemars Piguet COO Bruno Moutarlier. 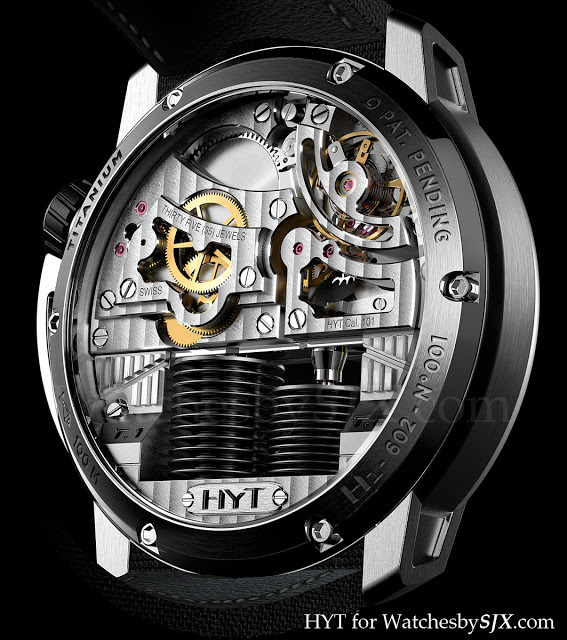 The group comprising Jean-François Mojon and his company Chronode SA worked on the watch movement, while the other team made up of HYT’s founders, Patrick Berdoz, Lucien Vouillamoz and Emmanuel Savioz, in a company known as Preciflex, dealt with the fluid mechanics. 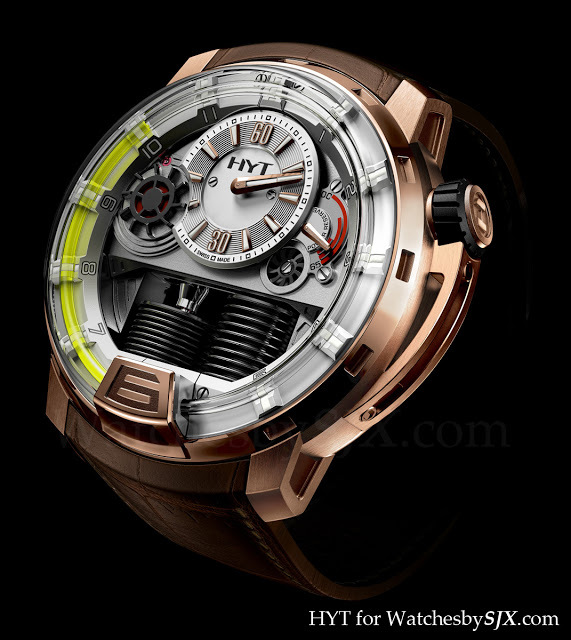 It was Mr Vouillamoz came up with the idea of a hydro-mechanical watch in 2002. And the latter group had the advice of Helbling Technik, a technical consultancy with experience in medical devices which use fluids. 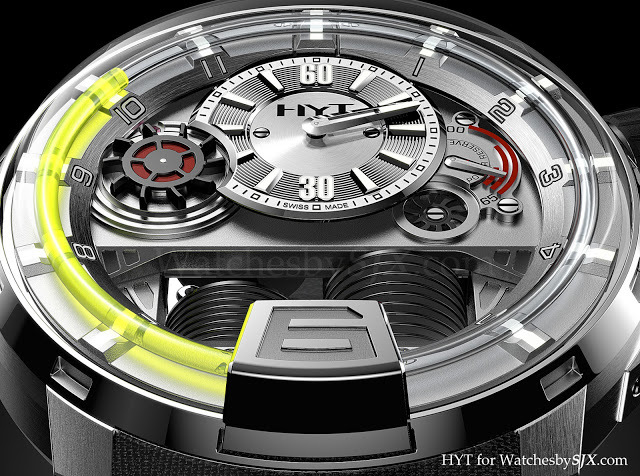 Interestingly several of the people involved in HYT have medical technology backgrounds. Mr Berdoz founded and sold prosthetics company Precimed, while board member Michael Orsinger is a senior Novartis executive. 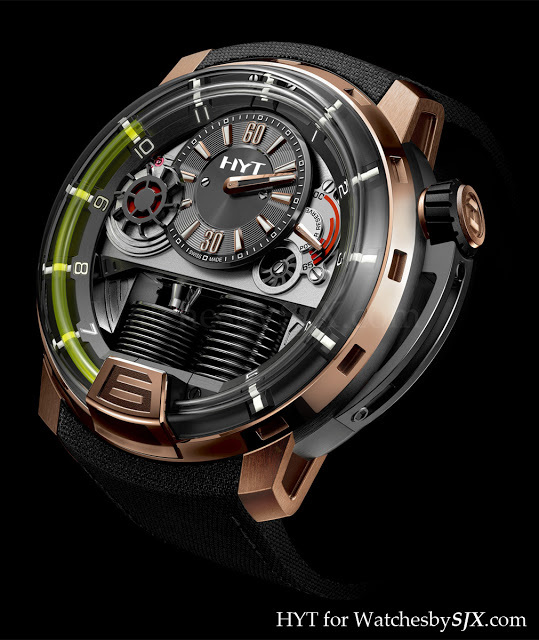 And HYT itself is led by Vincent Perriard, formerly the CEO of Concord and then Technomarine. While at Concord Mr Perriard experimented with a liquid power reserve display in the Concord C1 Quantum Gravity tourbillon, which was an enormously expensive; only a handful were made before its maker, BNB Concept, went bust.